Sometime last year, I had a dream. A dream that my favourite sportsman, Roger Federer would once more enthral us on a big stage with his magnificence. Now for the non tennis fans, you have to know that 2013 was a bad year for someone like Federer. And for his loyal fans like me, it was heart breaking. My dreams do have a way of coming true. Since I dreamt of a big occasion, I naturally assumed it would happen at one of the four majors we have in tennis. I also dreamt of it being on clay, so perhaps this moment will come at Roland Garros, the lone Grand Slam held on clay? As 2014 went by, it was clear that it was going to be a season to remember. Roger Federer posted some excellent results, considering his age and what transpired the year before. Except for a handful of players, almost everyone else would have gladly traded in an arm or a leg for the season the Swiss had. But the man they call the Maestro is no ordinary player; he had his eyes firmly set on the game’s biggest trophies, age be damned! By that lofty standards, the year turned out to be a bit of ‘so near yet so far’ campaign. He came ever so close to adding to his record collection of Grand Slams and also reaching the summit of the rankings. If only a handful of random events had gone some other way…. But all along, under the radar of most people, a Davis Cup campaign for Switzerland was making smooth progress throughout the year. For long, Federer had played the lone gunman role in his country’s endeavours in this team competition but this year his compatriot, Stan ‘The Man’ Wawrinka stood up to be counted big time. Suddenly, the Swiss had a strong team and simultaneously got the good fortune of having its path to the final cleared out as none of the big/dangerous teams stood in its way. And as expected, they got to the final (but not without some drama). I remembered my dream from so long ago. Big stage, clay; clearly I was having a premonition about Federer winning in Davis Cup (to be held on clay for the final). The Swiss team had the second and fourth best player of the year while the French had a range of talented, dangerous players to pick from but none of them had a stellar year in 2014. On paper, it looked advantage Switzerland. But life rarely follows a script. Wawrinka looked to have run out of steam. And then Federer infamous back issues surfaced its ugly head once again. But the biggest jolt appeared to be an alleged spat between these two teammates. Rumour mongers had a field day with this, best friends came to blows they suggested. 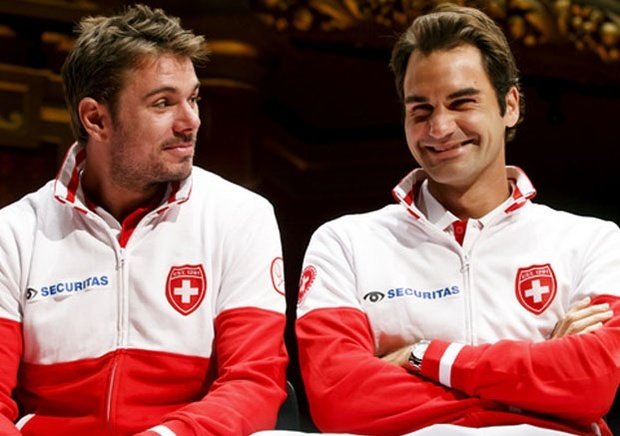 But Federer and Wawrinka sorted it out like mature adults and got back on the same page. Federer’s back was still, well, a pain. With no time to practise or even recover fully, he took to the court to play and to no one’s surprise he lost. Thankfully, Wawrinka had won his match before so the day ended with honours tied but still it was advantage France. The next day was the crucial doubles and Captain Luthi had a massive decision to make; risk playing Federer with Stan to give the best chance of gaining a point or rest him, gambling away a critical point for sure and hoping that the duo can win both their matches on Sunday. Many expected the French to claim victory in the doubles either way and so most of us expected Luthi to go with option two. But the Swiss decided to go all in as the 2008 Olympic Gold medallist took to the court for their nation. What followed next was just pure exhilarating stuff (not if you are a French fan though) as Fedrinka rolled through their opponents to completely shift the momentum in their favour. Advantage Switzerland. Third & final day and it seemed the bad luck that had visited the Swiss a few days ago now went to see the French. Tsonga who was scheduled to face Federer pulled out with an injury and was replaced by Gasquet, a slightly less daunting proposition. However, with his back still unclear, it wouldn’t be wise to predict anything. Anticipation for the final day was huge, history was going to be made whatever happens. I don’t have the actual numbers, but I have a feeling that an overwhelming majority wanted Federer and Switzerland to win the Davis Cup for the very first time. A record crowd turned out in the stadium to witness this match and possibly millions more tuned in on TV. There was massive pressure of the occasion, having his whole nation’s hopes on his back (literally) but it didn’t show on Federer’s face or play. A man like Roger Federer lives for moments like this, bad back or not and he certainly didn’t disappoint. He was magnificent from start to finish, even touching God Mode occasionally in the match. I subscribed to the channel airing this match only a few days back and that is by far, one of best things I have done for myself in recent times. It was almost exhibition stuff. Gasquet fought but he was clearly outmatched against a focussed, controlled and aggressive Federer. I remembered my dream, Federer at his best once again on a grand stage. The end came by swiftly and on match point, Federer hit a gem of a drop shot to clinch the title for his country. 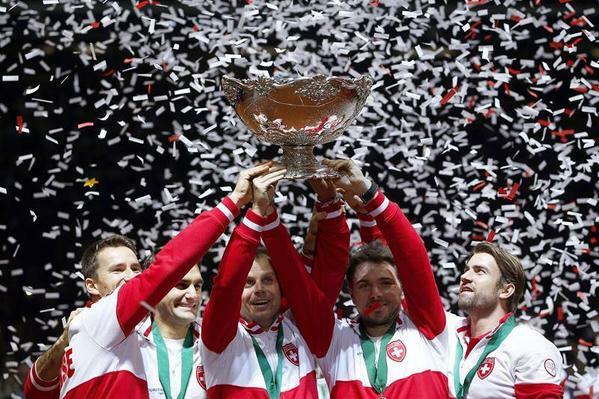 The Swiss are the Davis Cup champions of 2014, time for the Red & White to celebrate. They said his resume became complete today and that his legacy became richer. In Federer’s words, this was not about him or his legacy but “one for the boys”. For me, I saw an awesome display of tennis, one more time. For me, my dream had come true. Federer’s dream came true. Switzerland’s dream came true. Federer fans’ dream came true. Because, dreams Do come true. And, I am just gonna leave this here….. This entry was posted in Review, Tennis and tagged Davis Cup, Federer, France, Switzerland, tennis, Wawrinka. Bookmark the permalink.